Make a Quilt in a Day: Log Cabin Pattern, by Eleanor Burns, was the first quilt book I purchased, and the Log Cabin pattern as demonstrated in that book was used in the first 12 quilts I made. I followed her instructions precisely, and appreciated her invaluable tips and great pictures. 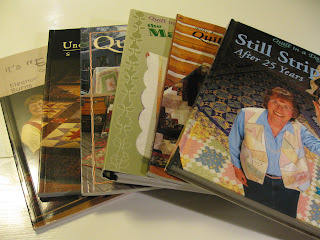 The next book by Eleanor I bought was Underground Railroad Sampler, followed by Still Stripping After 25 Years, then Quick Trip Quilts, It's "El"ementary: Quilting Tips and Techniques and, finally, The Magic Vine. I love Eleanor's expressive personality, I am impressed by her story (and can relate to it at a very personal level), and by her accomplishments. Eleanor has been instrumental in making the art of quilting more accessible and easier to learn. Once I grasped the basics from her books, I was never again afraid to tackle more involved techniques. I highly recommend her books and techniques to any aspiring quilter.